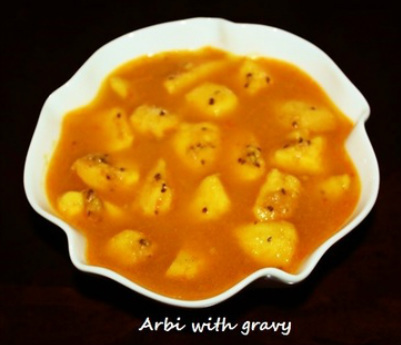 A﻿﻿rbi with gravy is a very simple unique and flavorful dish. It is usually served as a main dish, with wheat or kutu flour paratha (Buckwheat flour). Arbi is a root and in Northern part of India it is also known as Ghuiya and Taro root in English. Arbi (taro root) is much like the potato, which can be prepared in variety of ways. 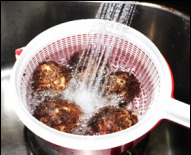 You can boil them, fry them and make different kinds of curry dishes. Numerous dishes are prepared with Arbi for fasting (varats) meals. Arbi is typically covered with a brown, hairy skin and have white flesh inside. The hairy outer coating of arbi is always removed when making arbi dishes. 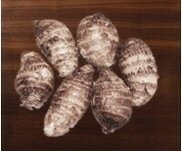 Removing the skin of arbi can cause skin irritation by the juices secreted by the taro root. Taro roots can be found in Indian grocery store or in Ethnic markets. much hair as you can. medium heat for about 2 minutes or until carom seeds are fried. 5. Add chopped Arbi pieces, salt and 2½ cups of water and mix with spices. steam goes down. (Different brand of cooker required different time to cook). skins or show signs of mold.